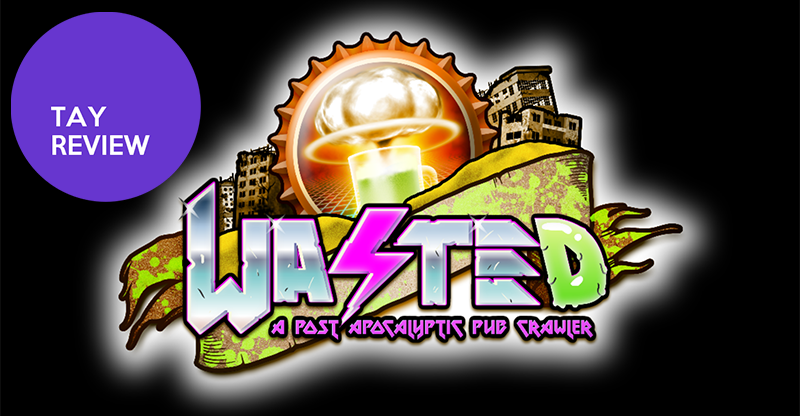 In early June, a game called WASTED: A Post-Apocalyptic Pub Crawler released on Steam. Wasted received mostly positive reviews but with one glaring complaint from players and critics: the game was too damn hard. No one could finish the first level because of the perma-death system. AND LO, I HAVE COMPLETED SAID CHALLENGE WITHOUT REGRETS (but some exhaustion). Edit: Kotaku’s Nathan Grayson also covered the game right after its’ release, you can check out his gameplay footage here. Wasted is a first person perma-death dungeon crawler which takes hints from all forms of media, but most of all, Fallout. The game is chock full of simple but pretty visuals, a great sense of humor, surprisingly clever enemy design, and a stupidly amazing premise. Wasted takes place in a post-apocalyptic California called the “Western Wastes” where instead of everyone killing each other like in fallout 4, they instead went on a never-ending radioactive bender and began killing each other. You, the “Waster” must handle the daunting task of raiding five vault “Cooler” survival bunkers in search of booze and glory. Meanwhile, a dark, religious organizations aptly named the “Syndicate Of Buzzkills” or S.O.B’s (for the sake of a joke) are working towards some dark plan to “purify” the Western Wastes. Your job is to find out what their plans are while getting as loaded with weapons and alcohol as possible. Wasted sticks to its premise. Everyone is stupid and the AI accounts for it. Enemies run into mines, they shoot their friends, fall into acid, and its all intentional. The player can take advantage of all of this, luring enemies towards explosive barrels, tricking them to aim at their teammates, causing them to fight each other. Its a pretty ingenious way to design AI without having to make it complicated. Of course, there is also intelligent AI in the bosses of each dungeon. The first boss is a straight (intentional) ripoff of Revolver Ocelot, and has a weapon which bounces off of walls, and does double damage when you bounce bullets off a wall into the enemy. During the fight, the boss keeps his distance, hiding behind walls and trying to ricochet bullets towards you. Its tough, fun, and takes you off guard from all the stupid enemies you encounter beforehand. Wasted has one of the most ironic gameplay mechanics to ever be included in a first person dungeon crawler. Throughout each Cooler are one of two effect giving items: unmarked flasks and booze bottles. These alcoholic beverages are surprisingly varied with some of the dumbest effects I’ve ever seen from “Every time you kill an enemy, there is a 1% chance they will actually just be a dog,” or “when you kill an enemy, they blow up”. The unmarked flasks can give you a random stat buff or debuff, and its up to the player to decide whether they want to take the chance of getting a debuff. The booze bottles are rarer but also appear every three floors as checkpoints. These booze bottles give you better buffs the lower you go in each dungeon, but sometimes there are only debuffs. These booze bottle buffs stick to your character and stay with you until you die and move onto the next blank slate character. These booze bottles are the only way to exit a dungeon besides getting to the end and beating the boss. What this mechanic means, is although the premise of the game is getting as boozed-up as possible, to succeed one must manage how much alcohol they intake, not drinking too much to avoid ruining your character’s stats. For every floor, depending on the size of the floor, there is a hidden timer. When this timer hits zero, the Purifier appears. He has a minigun, and Wasted’s equivalent of Fallout’s power armor. The first time I encountered the Purifier I was confused and terrified. The Purifier is entirely designed to punish you for taking too long to reach the end of the level. He’s also been the most controversial part of the game, and arguably the number one reason the game is so tough. In a game where you are constantly having to look around for ammo and healing items, the Purifier forces you to do so faster. If you can’t loot move fast enough, the Purifier will catch you. Thankfully its not as hard to kill or avoid the Purifier as it seems. He moves slowly, he has to stop shooting to reload every few seconds, and he can easily be knocked back to stop his shooting. I personally feel he is necessary to the game as without the threat of the purifier, there’s no sense of urgency in each level. When you have a timer counting down to your own death, you feel a lot more rushed in finishing the level which is important in a game as repetitive as Wasted. There are some nasty bugs and some unbelievable exploits which really break the game. One issue has gun traps spawn in such a way where they face directly at doors you open, so when you open a door, you die instantly, losing everything. Apparently this is a “feature” of the game’s randomly generated dungeons but in my opinion playing as a single character for 6 hours then losing all of your progress to no fault of your own (all you did was open a door!) is a part of the game which should not occur. There are also bugs which delete items in your inventory, cause you to fall through floors, and in one case, a quest-giving character in the game’s town SPONTANEOUSLY EXPLODED. YEAH A DUDE JUST EXPLODED FOR NO REASON. But these bugs are extremely rare (I couldn’t even find anyone who saw a character explode other than myself on the steam forums). So they aren’t a real reason to not buy the game. There are also some ridiculous exploits, including one which completely removes the perma-death system from the game. When you die, you can force quit the game when you alt-tab before you move to the loading screen. When you restart the game, you are back at the start of the dungeon, with all your inventory intact. The developers of the game have received a lot of flak for supposedly not supporting the game so I doubt any of these issues would actually be fixed in the future. The boss battles in Wasted are the most fun and exciting parts of the game. They take much more skill than any part of the game and test how good you are at managing your ammunition and healing items. Throughout my 37 hour playthrough of the game, I only fought three boss battles. To compare, I just recently finished Dark Souls II in 72 hours, in which I fought 30 bosses. There are also hundreds of different enemies in Dark souls II whereas Wasted only has about 10 with variants of the default human with gun enemy. If Wasted’s main allure is its difficulty, it shouldn’t stop being difficult because I figured out how to easily beat every character. I reached a point in the game where my armor and knowledge of the few enemies was so good I was almost un-killable. I was practically speedrunning the last two dungeons with how easy they were as opposed to how difficult the first two were. The game got boring because I was waiting for something new to happen, and it didn’t. There are some cool guns in Wasted but they’re far and few in between, with the only cool weapon I used throughout my playthrough being the aforementioned Ocelot Revolver, which you can ricochet off of walls for extra damage. Sadly, even then ammunition was rare and I only got the chance to spray down enemies with the most entertaining weapon in the game for one of the five dungeons. In a game which gets highly repetitive, only getting to use the cool weapons once seems like a pretty poor design choice. Most weapons are pretty cookie cutter besides the laser weapons which are pretty mediocre anyways. At least there’s plenty of pistol ammo lying around. Too bad there aren’t any interesting pistols in the game. Whether the game is any good depends on how much willpower you have as a human being. Wasted has so many small good things about it, but a few HUGE bad things about it. The writing and premise works, everything in the game feels like it fits, and gameplay is a surprising ocean of depth, but for all the depth, you hit the sea floor pretty fast. The developers have said they were working on mod tools, so the possibility of more content through mods is still possible for the future. This is definitely a game to check out, but not everyone might be able to finish it.